Johnson is considered the best player out west and maybe even the nation. He is a strong, versatile wing who can do it all. He can score from anywhere on the offensive end and is a physical presence who knows how to rebound the basketball. Johnson was scheduled to take an unofficial to USC last weekend but decided to reschedule. With Kansas now off his list, Johnson might take an official visit to USC. He recently had an in-home visit with USC on Monday, which he said went well. Johnson’s recruitment is looking more and more like a three-horse race between Kentucky, Arizona and USC. Chatman is another extremely talented wing that has great length and can score the ball in a variety of ways. He had an official visit to USC last weekend. Oregon and Arizona seemed to be leading his recruitment before the visit with Michigan and USC still in the mix. Chatman will visit Arizona this weekend. Craig is a very athletic big man with great length who runs the floor exceptionally well. 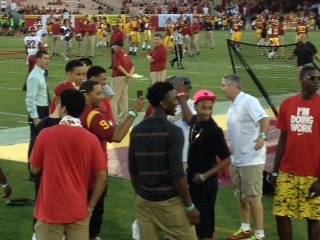 He officially visited USC on September 7th along with Jordan McLaughlin. The Trojans have an excellent shot to land him, as they currently appear to be the leader in his recruitment. Buford is athletic power forward who is a dynamic leaper. His ability to finish above the rim would be a perfect fit to catch lobs in Enfield’s system. Buford plans to officially visit on October 25th. USC has a solid chance to land Buford, but, as of now, it appears that South Carolina appears to be the favorite. Pope is an extremely athletic and bouncy forward who has tremendous upside. He recently broke his leg for a second time and had to undergo surgery. It will be interesting to see what schools keep recruiting him after this injury. He has recently scheduled official visits to Gonzaga, Kansas and San Diego State. USC appears to have a very slim chance at this point. Welsh is a player who has improved at a vast rate out the last few years. He still is not the most mobile big man, but is a great rebounder and has established very nice low-post game with nice touch around the basket. He has scheduled visits to Cal, UCLA and Colorado. Those three schools, particularly Cal, seem to be leaders but Welsh plans on taking all five of his official visits, so USC still has a small chance. Pickens is great shooter with an exceptional basketball IQ. He listed USC in his top 7 in mid-August. Nothing much about his recruitment has been recently released. All signs point to him leaning Arizona State right now. Shayok is a big talented wing from New Jersey. USC offered Shayok in late July and Enfield recently visited in-home with him in early September. It is unclear whether Shayok will decide to visit USC or not. He appears to be leaning Marquette at the moment. Kell is a talented scorer and a flat out pure jump shooter. His jump shot is very smooth and he has excellent range beyond the 3 point line. USC entered his recruiting scene pretty late and it appears extremely unlikely they will snag him. He has already taken four of his official visits. He had a fifth visit scheduled to take to Arizona but cancelled it. He appears to be heavily leaning San Diego State at this point. Another athletic big who is extremely raw. The Los Angeles native said he wants to stay close to home in California. Nothing has been released about his recruitment lately, so it is unclear if USC is still involved. Winslow is a very athletic and versatile wing who is already an elite defender. Winslow does not currently have USC in his top 8 but has talked about playing college basketball with Stanley Johnson. Johnson has said there is a chance both could end up at USC. The chance of that happening is extremely slim. As of right now, Arizona seems to be the favorite for Winslow with Duke not far behind.